Chelsea have terminated the contract of assistant first-team coach Henk ten Cate, the club has confirmed. The decision was reached following a meeting on Thursday morning. The news comes five days after manager Avram Grant was sacked despite the club reaching the Champions League final and finishing second in the Premier League. "As a result of the changes, and in light of any forthcoming appointment, it was clear this is the correct decision," said a club statement. 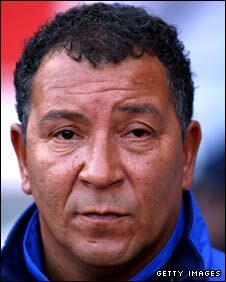 Former Ajax manager Ten Cate, 53, had said the club told him his position was safe following the dismissal of manager Avram Grant. The Dutchman joined Chelsea as assistant manager in October, but his fate appears to have been sealed by the club's failure to win a trophy for the first time in four years. His dismissal suggests Frank Rijkaard is not among the candidates to replace Grant - Ten Cate was assistant to his compatriot at Barcelona when the club won the Champions League in 2006. Does Henk ten Cate's exit give any clues as to who will become the new Chelsea manager? Quoted in the Dutch media on Tuesday, ten Cate insisted he wanted to remain at Stamford Bridge in the wake of Grant's dismissal. "Half an hour before Chelsea made the message about Grant officially known, I was called by the chief executive Peter Kenyon," he told Voetbal International. "He informed me that the departure of Grant will not affect me. I'd rather go on that. I have a contract until 2010." Rijkaard, Sven-Goran Eriksson, Michael Laudrup, Roberto Mancini, Mark Hughes and Luiz Felipe Scolari have all been linked with the vacant manager's role at Chelsea. Steve Clarke remains on the Chelsea coaching staff but it is believed that he will end his long-term association with the club to pursue a career as a manager.